Great Pierce, keep on making music! I heard my steel drum band in 1960, what a sound. Happy Thanksgiving to you all. If Pierce is picking out songs by ear, he is doing great! You may have a musician on your hands. I love the way he made the Pringle can instrument. That is really neat and you could recognize the song! Wait until he builds the electric version. Love it! and That face, such a happy child. Happy Thanksgiving to y'all as well. He must have been playing very well if you recognized the song! This was a great idea and he executed it so well! I bet the drums are so much fun for him. I hope you all have a wonderful Thanksgiving! You might have a young Ringo Starr in the making there. He did quite a good job on the homemade drum set. What a great idea, too. What a cool club; I wish there was a steel drums club at our school! 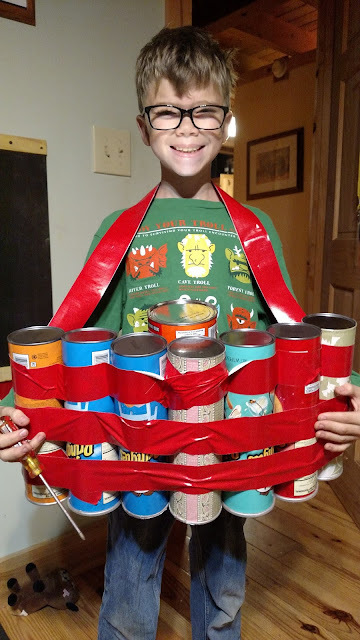 I love Pierce's project--what a sacrifice to eat all those Pringles! Your son has amazing creativity. I look forward to the spring concert. What a cutie you have! Actually all your kids are cute! I love that he could play a song with the cans. Mica started the trumpet this year. It's loud.